BootStrapToday brings intelligence and integration into the Application Lifecycle Management/Software Development Life Cycle Management and makes it easy for software development teams to be highly productive. Collaborate efficiently with right information at right places. Execute smoothly with built-in automation, integration and intelligence. Detect software bugs early and maintain code quality. Reduce your project cost significantly. Improve management ease and clarity. 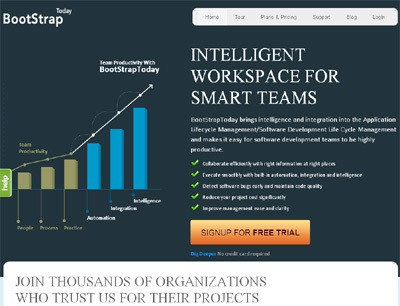 BootStrapToday has advantage in terms of built in Intelligence and automation.